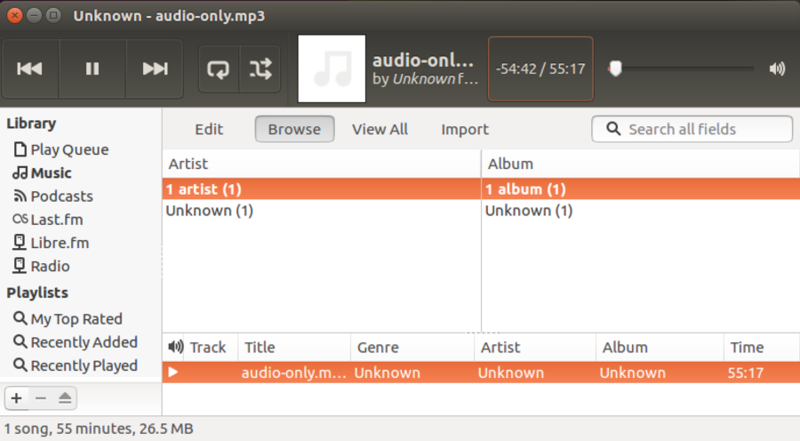 How Can I Extract MP3 Audio from a Movie File? I want to extract just the audio from an MP4 movie file I have. The wrinkle: I’m on a Linux system. Is there some way on Linux, maybe on the command line, to extract the audio from a movie file? There’s a terrific command line tool that can easily do what you ask, but even better, it works on Linux, Windows and MacOS X systems. The program? FFmpeg. You can grab a copy for free off the FFmpeg Web site or since you’re on a Linux system, you can install the module directly too. I’ll show that in a minute, but first, let’s talk briefly about the program itself. You indicated that your source file is in MP4 format, but this’ll work if it were an MKV, AVI or even a MOV file too. Audio output as MP3 is also an industry standard at this point but the program supports a wide variety of other audio formats too. Different flavors of Linux use different package managers, and if you’re on a Mac system or Windows the install will be a bit different (see the Web site referenced earlier for details) but “sudo apt install ffmpeg” on the Ubuntu command line pushes out quite an installation. Finally, though, it’s done and ready to use. More information about the mp3 audio file, but the real test? Let’s listen to it! Well, the interface isn’t going to win any awards, but you can see that the audio extracted is in a valid MP3 format and is playable. In fact, it’s perfect and lets me listen to it while driving, a bonus versus having a movie. And that’s how you do it with the handy FFmpeg program. Hope that helps you out! Pro Tip: We have lots of Linux help here on the site, please spend a few minutes check it out.